Click on photos for detail. Wholesale and quantity discounts available. Prices for for each lollipop, not sets as some are shown. 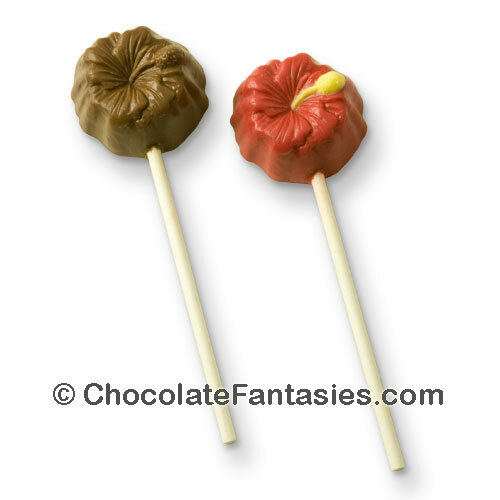 Sticks can be omitted by request on many lollipops. 2.5 ounces, clear poly bag, tied with ribbon. Available plain as shown or relief brushed with elegant gold dust or shimmer pearl. Aloha, the traditional greeting for Hawaii. 2 ounces, clear poly bag, tied with ribbon. Available plain or relief brushed with elegant gold dust or shimmer pearl. 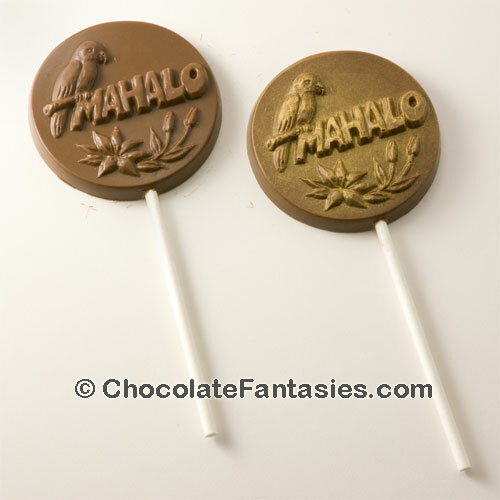 Mahalo means 'thank you' in Hawaiian. 2 ounces, clear poly bag, tied with ribbon. Available plain or brushed with elegant gold dust or shimmer pearl. Cute girl with grass skirt dancing the hula.. 2 ounces, clear poly bag, tied with ribbon. 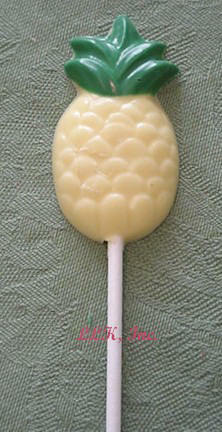 Available plain or brushed with elegant gold dust or shimmer pearl. Beautiful hula dancer with a moon or sun behind her.. 2 ounces, clear poly bag, tied with ribbon. Available plain, two-tone or brushed with elegant gold dust or shimmer pearl. 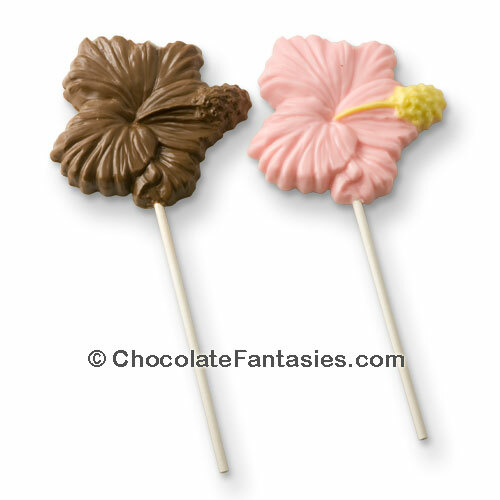 Assorted Hawaiian themed mini chocolates. 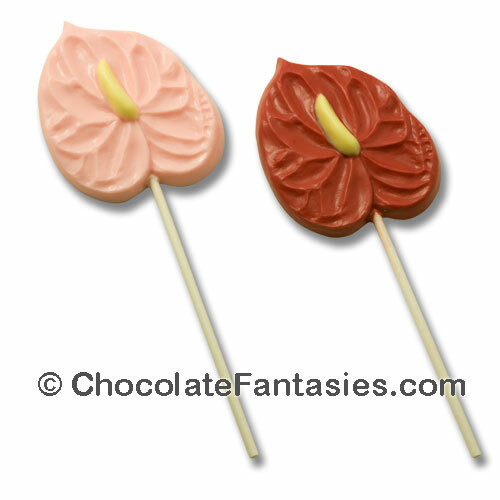 Great for receptions, favors, pillow mints, cupcake toppers. Available plain or brushed with elegant gold dust or shimmer pearl. 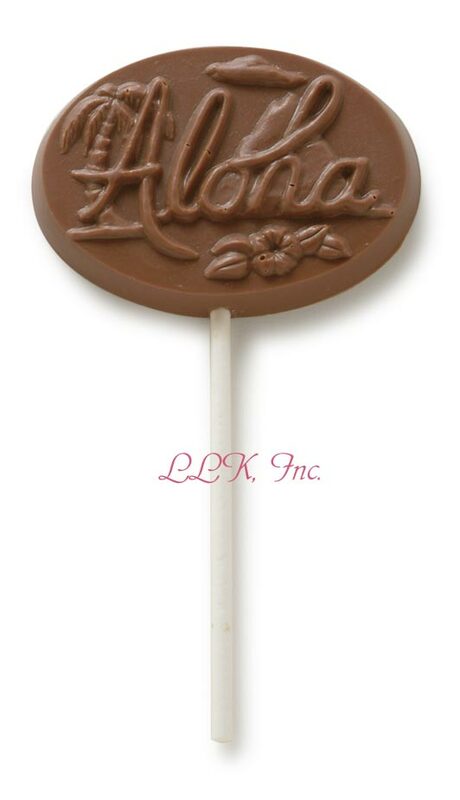 Hawaiian Shirt Lollipop - $3.00 ea. 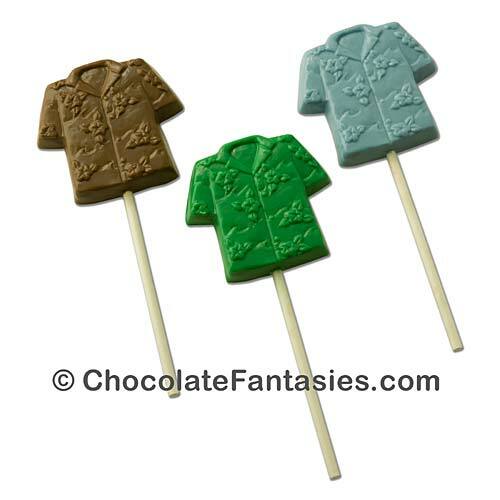 Hawaiian shirt available in many colors. 2 ounces, clear poly bag, tied with ribbon. 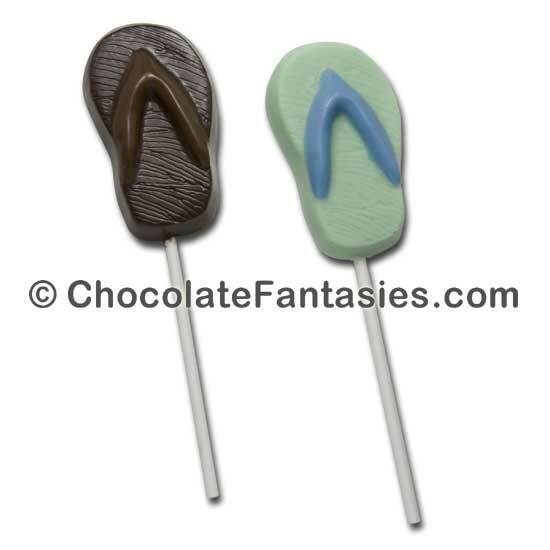 Thong, Zorie, Slipper, Flip Flop Lollipop - $3.00 ea. Available in single flavors or two tone. 1.5 ounces, poly bag, tied with ribbon. We can make any color combination of the sandal, just email us. Lovely detailed palm tree with what you could have as a sunset or moonrise behind it. 2 ounces, clear poly bag, tied with ribbon. Available plain, 3 color or brushed with elegant gold dust or shimmer pearl. 1.5 ounces, clear poly bag, tied with ribbon. Available plain, two color or brushed with elegant gold dust or shimmer pearl. Coconut flavor is available for .15 each extra, minimum 12 pcs, email us. 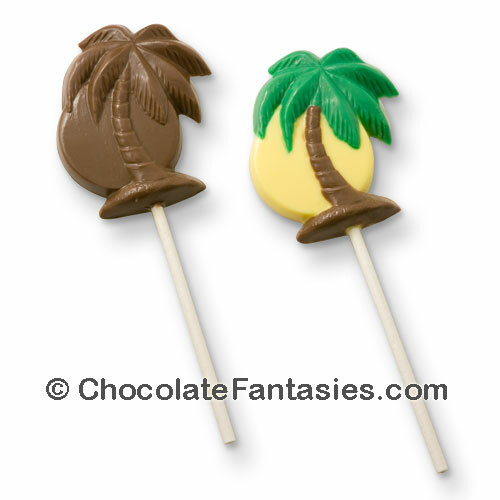 Available in one color or two color (choose chocolate flavor, top will be green). 1 ounces, cello bag, tied with ribbon. 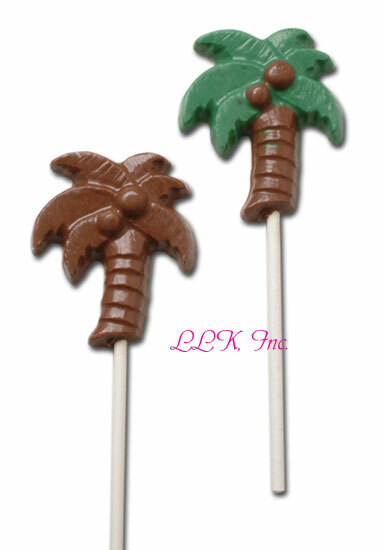 Coconut flavor is available for .15 each extra, minimum 12 pcs, email us. Palm tree with flamingo, click here. Two color, choose chocolate flavor, top will be green. 1 ounces, cello bag, tied with ribbon. 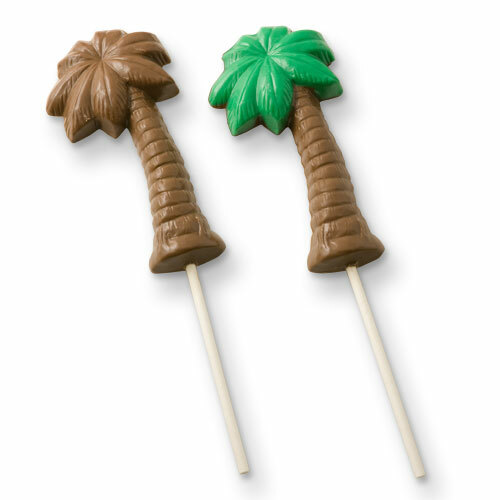 Coconut flavor is available for .15 each extra, minimum 12 pcs., email us. More palm trees with flamingoes, click here. Beautiful detailed flower. 2 ounces, clear poly bag, tied with ribbon. Available plain one color, two color or brushed with elegant gold dust or shimmer pearl. If a color you want is not listed, we make custom colors for you, just email. This classic tropical flower is beautifully detailed. 2.5 oz, clear poly bag, tied with ribbon. Available plain one color, two color or brushed with elegant gold dust or shimmer pearl. If a color you want is not listed, we make custom colors for you, just email. 1 ounce, clear poly bag, tied with ribbon. Available plain or brushed with elegant gold dust or shimmer pearl. If a color you want is not listed, we make custom colors for you, just email. 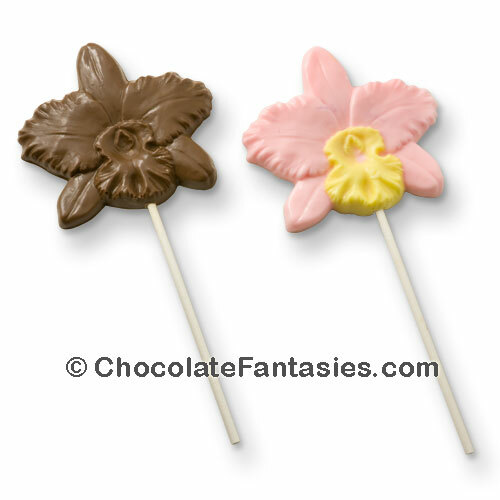 Large Orchid Lollipop - Starting at $3.00 ea. 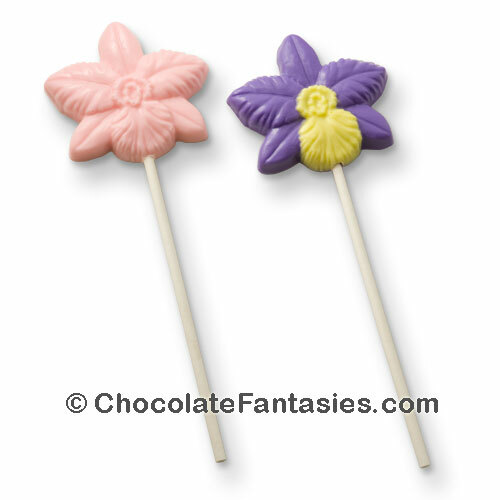 Medium Orchid Lollipop - Starting at $2.75 ea. This classic tropical flower is beautifully detailed. 1.75 oz, clear poly bag, tied with ribbon. Available plain one color, two color or brushed with elegant gold dust or shimmer pearl. If a color you want is not listed, we make custom colors for you, just email. Available in one color or two color with green top. 1 ounces, poly bag, tied with ribbon Pineapple flavor is available for .15 each extra with a minimum of 12 pieces, email to add on. 2.7 oz., poly bag, tied with ribbon. 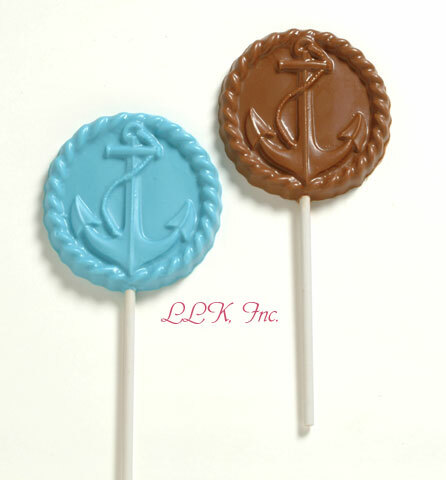 Nautical Anchor Lollipop - $2.75 ea. 1.5 ounces, poly bag, tied with ribbon. Stay tuned! We have more molds being posted shortly. 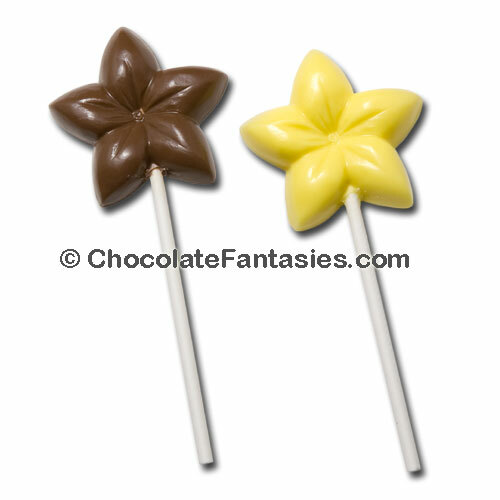 All of our lollipop chocolates can be made without a stick, just write 'no stick' in the special instructions line of the shopping cart when you check out. 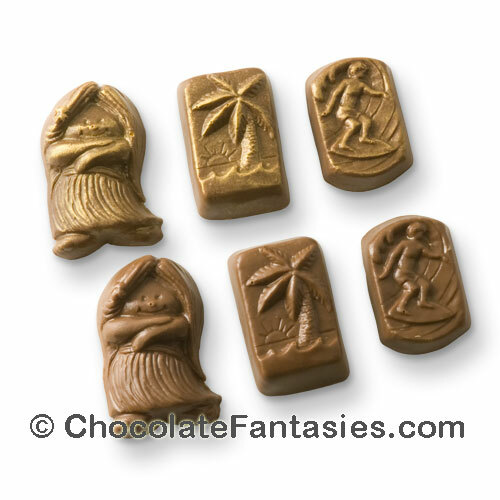 Click the conch shell for Chocolate Seashells, Rocks & Sand. Click the fish for Tropical Fish, Sharks, Angel Fish and more. 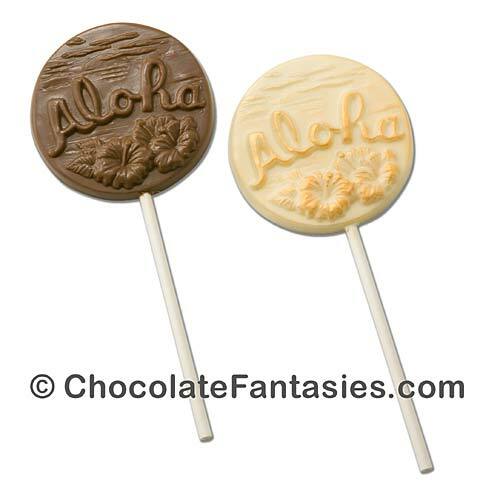 Click the sailboat scene lolly for Sailboat Chocolates. 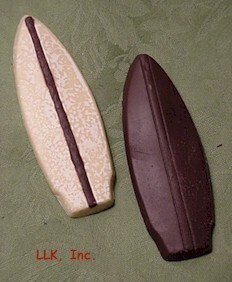 Click the ship for Pirate Chocolates. 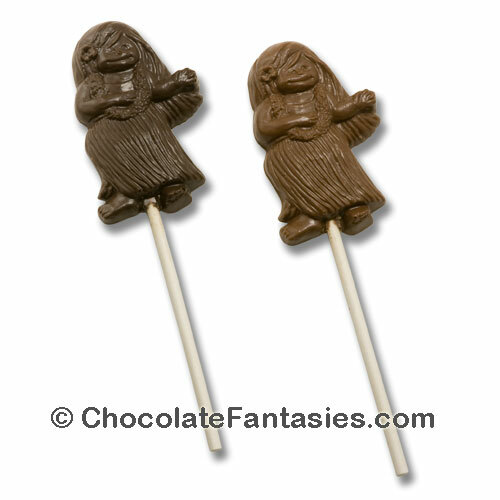 Chocolate Mermaids will be coming soon! 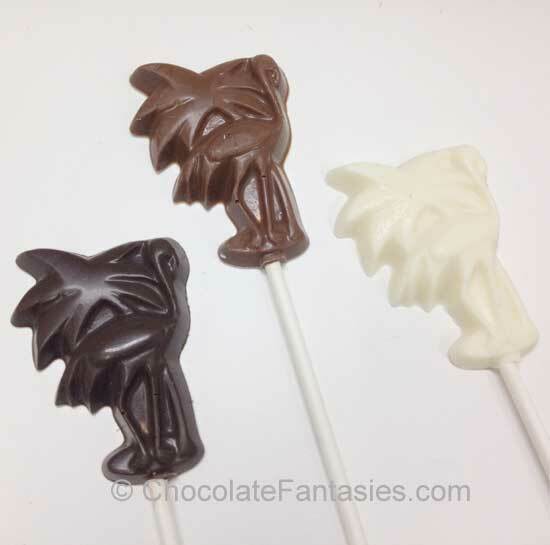 If our selection of chocolates do not represent what you are looking for, please let us know what you'd like to have especially made for you. 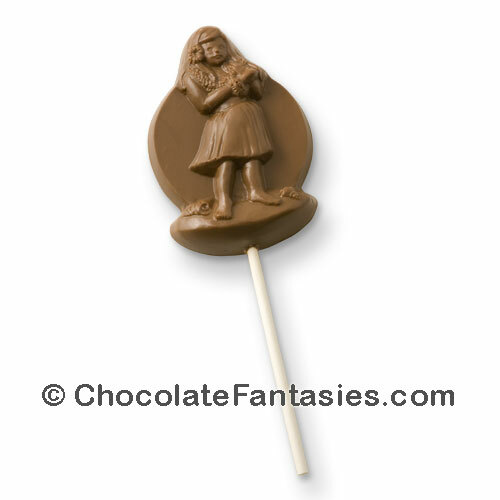 Our chocolates are considered a custom order. Please allow 2 or more weeks for anything over 4 pounds during holiday seasons. Surcharges apply for any Fed Ex or rush order. Click here for more information you may need. It is helpful if you put in the card message/special instructions line the date you need your order by. Thanks!